After successfully launching the book Those Who Inspire Bahrain on the 22nd of October, under the patronage of H.E. Sheikh Hisham Bin Abdulrahman Al Khalifa, The Governor of the Capital Governorate, in conjunction with the Manama Entrepreneurship Week and with the active contribution of the Labour Fund “Tamkeen” as a strategic partner, TWI has started touring the public universities in the Kingdom and donating free copies of Those Who Inspire Bahrain to inspire and offer the local youth accessible mentors. University of Bahrain is the biggest public university in Bahrain with more than 27.000 students. It is also where TWI has decided to donate the biggest amount of books, 1.200 copies, thanks to the strong relationship built between TWI and the Office of the President, the College of IT and the English Language Centre. 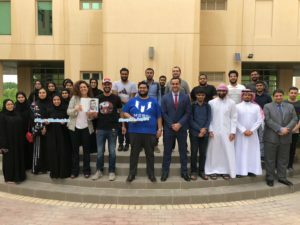 The free donation of the books was held by TWI to University of Bahrain and in total 10 Inspiring Talks were organised so that UoB students can exchange directly with some of the Inspiring Bahrainis. TWI donated the 1.200 copies of Those Who Inspire Bahrain to UoB thanks to the partners of Those Who Inspire Movement. Selected Inspiring Bahrainis from the book, such as Huda Janahi, Hamed Fakhro, Fajer Mufeez and Eman Nooruddin, also talked to the students about their commitment as mentors of Those Who Inspire Movement and how was for them to choose their career path. 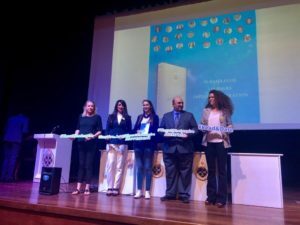 The English Language Centre received 900 books to offer to their students as part of innovative pedagogy in developing English language proficiency. The purpose of Those Who Inspire is to empower Millennials and to boldly encourage them to pursue their dreams and, above all, believe in themselves. Giving students a copy of Those Who Inspire Bahrain that will allow young people an opportunity to explore a wide spectrum of role models and mentors from Bahrain. “Our students in the English Language Centre are young learners but with big dreams and I strongly believe that this book Those Who Inspire Bahrain will help them explore themselves, and find meaningful career visions according to their passion,” says Dr Ghada Ahmed Jassim, Director of English Language Centre at University of Bahrain. Don’t miss to read the UoB newsletter to find our more about our collaboration and follow us to learn more about the TWI Movement.